Before we solve the worked-out problems on complementary and supplementary angles we will recall the definition of complementary angles and supplementary angles. Two angles are called complementary angles, if their sum is one right angle i.e. 90°. Each angle is called the complement of the other. Example, 20° and 70° are complementary angles, because 20° + 70° = 90°. Clearly, 20° is the complement of 70° and 70° is the complement of 20°. Thus, the complement of angle 53° = 90° - 53° = 37°. Two angles are called supplementary angles, if their sum is two right angles i.e. 180°. Each angle is called the supplement of the other. Example, 30° and 150° are supplementary angles, because 30° + 150° = 180°. Clearly, 30° is the supplement of 150° and 150° is the supplement of 30°. Thus, the supplement of angle 105° = 180° - 105° = 75°. 1. Find the complement of the angle 2/3 of 90°. 2. Find the supplement of the angle 4/5 of 90°. 3. The measure of two complementary angles are (2x - 7)° and (x + 4)°. Find the value of x. Therefore, the value of x = 31°. 4. 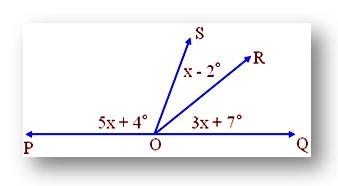 The measure of two supplementary angles are (3x + 15)° and (2x + 5)°. Find the value of x. Therefore, the value of x = 32°. 5. The difference between the two complementary angles is 180°. Find the measure of the angle. Let one angle be of measure x°. Therefore, the two angles are 36°, 54°. 6. POQ is a straight line and OS stands on PQ. Find the value of x and the measure of ∠ POS, ∠ SOR and ∠ ROQ. POQ is a straight line. Therefore, the measure of the three angles is 17°, 64°, 99°. These are the above solved examples on complementary and supplementary angles explained step-by-step with detailed explanation.